As I was telling some colleagues , this sudden spate of being called to do keynotes means that I am not so young that I am not taken seriously and not so old that I am seen as being senile. Its that age I suppose ! 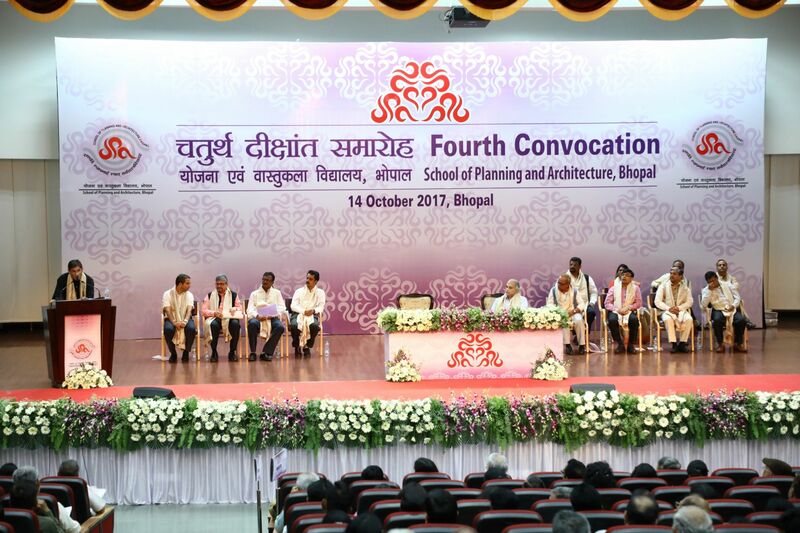 So after the Kurla Varkey Memorial Talk and the NIRMA Foundation Day Talk ( Both blogged earlier); here is the one I did for the SPA Bhopal Convocation. I have not really attended convocation ceremonies such as this. In the 80s when we graduated, it was fairly normal that we would be found at the canteen by someone who would come over from the administrative office , and be told casually that our graduation diploma was ready- we would go , sign in a register, pick it up- often not even in an envelope – go back to the canteen and resume sipping our tea. No formality. No serious marking of the day. Nothing as a rite of passage. When I studied there were 11 schools, today there are over 400. But numbers is not the only thing that has changed. In the period from the 60s till the early 90s the world of architecture was constructed by a search of a certain sense of purpose that was philosophical. This manifested itself in many ways. For example architects were trying to evolve meanings of the new Indian modernism , or there was the search for identity in Indian architecture, or many tested the learning’s of the vernacular idiom , or the serving of a socialist conscience led to many affordable housing strategies and finance models ,or imagining of the idea of modern and scientific Institutions for a young and new country created a large body of work that we can look back upon today. This was coupled with a thirst to find and map a lot that we did not know about the country ; of the architecture of historical precincts, or settlements, or traditional methods of construction. All this formed the plasma of our thought. And that gave it a purpose that was a well defined one; one where we believed without a shred of doubt that our work made a better world. We were less concerned about how buildings looked, as much as how they were made, or what they stood for, or what they felt to our senses and bodies. The Hindu rate of economic growth also ensured that work happened slowly. And there was plenty of time to test our ideas. And the thought that it had to be a new idea, or a new trick , was one that we did not dwell on much- what did bother us was its layered meanings and its honesty. Buildings as the good historian and academic Miki Desai says ,were imagined to be a product of intent – and without that even if they housed activities, they were not architecture. They would lack a spirit . In those days it is, perhaps that spirit that all of us searched for. And when we read about the work of the pantheon of modern architects in India then ,the frame work within which they worked, seemed to continually reaffirm that the discussions that plagued us, were real. But slowly ,even as we were not watching the world changed. Before we knew it, India was galloping at a much faster growth rate Making money which was never seen as something that was in good taste , became the defining marker of success, and the world imploded – we knew instantly what was being built thousands of miles away even as the architect there thought it up. And we started drowning. The deluge was too strong. We started believing that working quickly, working with scales , and working in the ways that the rest of the world was imagining architecture needed to be our guiding light. Slowly but surely we forgot many of the lessons we had learnt over decades. About thinking things through. About imagining our realities and working with them. About testing many ideas on the drawing board. About understanding our purpose and limitations. But most tellingly we stopped believing in a collective future and only worried about our own. And even more tragically , we stopped believing that architecture mattered- and saw it only as a tool in some larger game of life. As a small bit to be tossed about carelessly, so long as it wore a shining garb. It was a time of confusion; or should I say a time where the rules of conduct were being redefined. Many of us looked around for new heroes- to see if what we imagined as our loss could be mended by learning from works of anyone willing to be our new Gods. Sometimes we imagined that we had found them; at others it proved to be a futile search. This was unsettling. And so to not let go , to find some comfort in old anchors, like good Indians ,we continued to celebrate those who had been celebrated a generation before us , and we find even today that those after us, often continue to revere the same,- not acknowledging the one single telling fact – that the old Gods were often telling old stories for a new world. And those stories were not helping. Were there really no heroes? No new Gods? In retrospect, I suspect , they were there – but they were different. Often folks experimenting in modest ways with the challenges a newer India was throwing at us. They were like scientists , working on small experiments and it was for us to learn from there and apply them at larger scales. But for many of us used to seeing Gods in a certain garb, it was our failing that we often did not recognize them. Also as we learnt more, understood more , a greater shock was in store for us. When we started going and actually evaluating the work of the masters; and while some work still held its ground, a large amount really was the creation of the words that they were drowned in- the work itself was simplistic , poorly detailed ,and simply unacceptable . This was a shock. Imagine spending all your life being told that there is a treasure under a rock and all you had to do is look under it when you wanted to, and it would be yours. And one day you do look under it and find nothing- but the crushing depression that the rock has made on earth. It takes a long time to accept this -leave alone admit it . And it leaves you with emotions of anger and betrayal- and it’s not a nice feeling. To deceive ourselves and beguile our minds, some of us continued to perpetuate the myth, some of us slyly benefited from the myth, and some of us were so lost that we did not know what to do next. The very purpose of architecture seemed to have been led astray and the work we thought would hold the light often did not. And all around us was and is a raging fire ; of mindless work that has no philosophical endeavor and is like an empty headed preening peacock. A new trick here ; a new trick there. And ladled with platitudes of it being green and sustainable as if that would save them from revealing their hollow innards. And we are building faster than ever. More than ever. And we often don’t seem to know why. And that dear students is the world that you will land in tomorrow. Should you be worried ? Is what I have said a picture of gloom? Of unrest ? Of trying times? It depends how you see it- but let me tell you how I see it for you. Simply put I am plain jealous of the times in which you will get to start your professional lives. It’s a country, where the world is connected in real time; this was not so for us. A country where the ghosts of the past slowly and surely being exorcised. ; we were weighed by them . A country where for decades the smokescreens of the past and the recklessness of the present had colluded to no great value and is now poised to welcome someone who will cut through the fog; and you are the folks who have that chance. So I am jealous ! And I so wish that instead of being handed over my graduation papers at the canteen decades back, I was wearing one of those gowns and graduating with you. Young, hungry, and leaping into such times, to make sense of it- to lend it meaning. So let me confess and say clearly- old dogmas, the borrowed dogmas, don’t seem to be serving us anymore. We live in a world where what is good architecture is something that we have diminishing agreement on. More than anything; the number of schools, or the pace of work , or the nature of work, if there is one thing that has changed greatly , it is that- as a community we have no agreement on what are the basic tenets that form good architecture and just so long as its built or its virtues proclaimed loudly ,seems to be sufficient validation. While this is the sad truth , it is also a huge opportunity. So I say this to you with some sense of swashbuckling adventure , this is a momentous time- a time when you can step out in the world , look around you , reflect and slowly start constructing a new language in architecture that has empathy, imagination and purpose. Steer forth; steer clear- and hold the course firmly, and don’t be bamboozled by a lot that you see around you – it’s not architecture. It may house function, but it has no spirit- it has no intent. But most of all, drown the noise around you; wily traders selling you false tales, old tales wanting to claim your mind- you will just have to drown them by the depth of your work. And look again around- if the dazzle of the old and new trinkets stop blinding you ; will begin to see the alphabets of the architecture that should matter; the work wont be large, or it may not be proclaimed loudly- but it will be well considered and thoughtful and in it will be the alphabets with which you can construct a language and an essay that has intent. But most importantly trust what you were taught here – in this college; because it does not matter what you are told to the contrary- trust me when I say that these academic foundations will be the bedrock of your life and what you have learnt here – will always guide you in your life hereafter. You may at times not see its value- but you will in time. I am jealous ! I wish I could be sitting with you now and be graduating with you. And launch many an adventure- but I suppose I will have the pleasure of seeing you all in coming years forging a new nation. And perhaps your energy, your honesty, will slowly reform a world where once again, ethics matter; where decency matters; where rigor and hard work mean something; and where true knowledge and skill are revered. Thank you very much . All the very best in your lives. And many thanks for giving me the chance to be here with you.